For all of its headline-making accomplishments for service to the poor and downtrodden, the Community of Sant’Egidio sees itself primarily as a group committed to prayer. 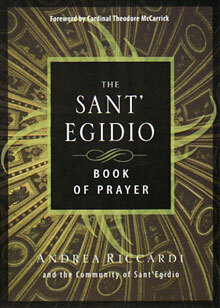 The Sant’Egidio Book of Prayer brings the community’s daily prayer to you, inviting you into its spiritual life of service and peacemaking. What is the constant spiritual source in your apostolic commitment? You sing of it often in paraphrasing the words of the Apostle Peter: “We do not have riches, only the Word of the Lord.” This is your strength – your trust in the feeble weapons of faith: prayer, love, and friendship. In each of your lives, let prayer always accompany your service of mercy. Pope John Paul II Speaking to the Community of Sant’Egidio in 1993 I can recommend this volume heartily. It contains so many of the answers to the most vital questions of our lives, because it moves us all along the journey to that Word who is Life itself. Cardinal Theodore McCarrick Archbishop Emeritus of Washington .